Justice Scalia: U.S. "will live to regret what the court has done today"
Justice Kennedy: Constitution should "remain in force, in extraordinary times"
WASHINGTON (CNN) -- Suspected terrorists and foreign fighters held by the U.S. military at Guantanamo Bay, Cuba, have the right to challenge their detention in federal court, the Supreme Court ruled Thursday. The decision marks another legal blow to the Bush administration's war on terrorism policies. Writing for the majority, Justice Anthony Kennedy said, "the laws and Constitution are designed to survive, and remain in force, in extraordinary times. Liberty and security can be reconciled; and in our system reconciled within the framework of the law." Kennedy, the court's swing vote, was supported by Justices John Paul Stevens, David Souter, Ruth Bader Ginsburg and Stephen Breyer, generally considered the liberal contingent. A congressional law passed in 2006 would limit court jurisdiction to hear so-called habeas corpus challenges to detention. It is a legal question the justices have tackled three times since 2004, including Thursday's ruling. Each time, the justices have ruled against the government's claim that it has the authority to hold people it considers "enemy combatants." Four justices agreed. In a sharp dissent, read in part from the bench, Justice Antonin Scalia said the majority "warps our Constitution." The "nation will live to regret what the court has done today," Scalia said. "Congress and the administration worked very carefully on a piece of legislation that set the appropriate procedures in place as to how to deal with the detainees," he said. "We'll study this opinion, and we'll do so with this in mind to determine whether or not additional legislation might be appropriate so that we can safely say, truly say to the American people, 'we are doing everything we can to protect you.' "
"I have long been an advocate of closing Guantanamo, so I would hope this is in furtherance of taking that action," Pelosi said. The appeals involve noncitizens. Sixteen lawsuits filed on behalf of about 200 prisoners were put on hold pending a ruling last year by a federal appeals court upholding the government's right to detain and prosecute suspected terrorists and war criminals. An attorney for one of the detainees, Salim Ahmed Hamdan -- Osama bin Laden's alleged driver and bodyguard -- said he would file an appeal asking that charges be dropped against the Yemeni native. "The clearest immediate impact of this ruling is to remove the remaining barriers for closing Guantanamo Bay. 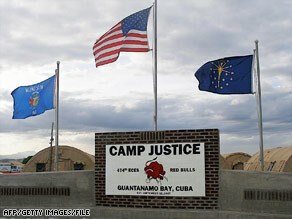 It means, in legal terms, Guantanamo Bay is no different than Kansas," attorney Charles Swift said. The law was a direct response to a June 2006 Supreme Court ruling striking down the Bush administration's plan to try detainees before military commissions. Most of the dozens of pending cases have been handled in the U.S. Court of Appeals in Washington, which in February 2007 upheld the Military Commissions Act's provision stripping courts of jurisdiction to hear "habeas" challenges to the prisoners' confinement. The detainees' legal team alleges the government is unfairly restricting access to potentially exculpatory evidence, including documents they may not know exist before pretrial hearings. "The difference in this case is that they have a congressional enactment cutting back on habeas corpus that they have to wrestle with," said Edward Lazarus, a leading appellate attorney and author of a book on the high court, "Closed Chambers: The Rise, Fall, and Future of the Modern Supreme Court." "And that, from a constitutional point of view, is really a different question." In a separate decision, the court refused to intervene in the case of two American citizens convicted in Iraqi courts but held by the U.S. military. The high court rejected lawyers' arguments that Mohammad Munaf and Shawqi Ahmad Omar should be released, saying that U.S. courts are not allowed to intervene in foreign courts.